All Tiger Cubs, including Bantam Cubs and Super Cubs, were built in the 1950s and 1960s using the prevailing standards of that time. This means that the fasteners - nuts, bolts, screws, etc. - are based on the old British 'imperial' specifications. The format of the threads and the sizes of the hexagonal heads used on these imperial fasteners are quite different from the modern metric (European/Japanese) and UNC/UNF (American) standards that are now widely used across the world. Working on a Cub is a lot easier when we understand these old British fasteners and the spanners they require. BSW, or just 'Whitworth' as it is often known, is named after Joseph Whitwoth, the engineer who first defined this particular thread format as the universal standard in 1841. Prior to this, many engineering businesses used their own thread designs for nuts, bolts and screws. Whitworth, along with its finer version BSF (detailed below), was the common standard for the engineering industry across Britain and much of the world right up until the 1940's. During the second world war interchangability started to become a global issue with military components being manufactured in the United States and then shipped to Britain for assembly with other, locally made parts. This rapidly accelerated the use of American UNC and UNF fasteners in Britain. Their use continued to grow after the war and by the 1970s UNC/UNF threads were widely used, especially in the British motor industry. Since then UNC/UNF threads have themselves been superceded by the international metric standard. As a result, BSW and BSF have become virtually extinct except on surviving pre-70's equipment. 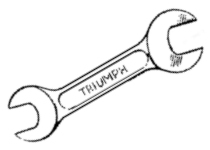 BSW Spanners - As you would expect, BSW threads are defined by the outer diameter, e.g. 1/4" BSW refers to 1/4 inch outside diameter. However, BSW spanners are sized by the thread size and NOT by the size across the flats. So a 1/4" BSW spanner is a lot bigger than 1/4" A/F - it's actually 0.445" across the flats! There is no match between Whitworth and A/F spanners. There is however a relationship between Whitworth, it's finer relative BSF and BSCy, British Cycle Thread. See spanner table below. BSF Spanners - As with BSW above, the spanners are marked with the thread size, not the size across the flats. There is also a direct correlation between BSW and BSF head sizes. The hexagonal head of a BSF fastener is the same size as the head of a BSW fastener one size smaller. For example a 5/16" BSW spanner fits 3/8" BSF heads. See spanner table below. BSCy, or 'cycle thread', is a fine thread that was used by British motorbike and bicycle manufacturers. It was often chosen where a finer thread than BSF was required on sizes greater than 1/4". As with BSW and BSF, the use of BSCy had declined rapidly by the 1970's. BSCy Spanners - Hexagonal head BSCy nuts, bolts and screws use standard Whitworth spanners with their heads corresponding to the equivalent BSF size. See spanner table below. BA is a fine thread used for smaller sizes below 1/4". It was particularly widely used in electrical components and other small, precision parts. The use of BA threads continued alongside metric alternatives for some time after Whitworth and BSCy formats had become obsolete. However, it has now been widely replaced by the metric standard. BA sizes are defined by a spectrum of numbers. They start at 0BA which is the largest at 0.236" diameter (approx 6mm) down to 16BA which is 0.031" (approx 0.8mm). However, apart from 1BA, 3BA and 5BA, odd numbers were very rarely used in practice. All sizes smaller than 10BA (0.067" / 1.7mm) were also quite rare. BA Spanners - Head sizes and therefore spanners are unique to the BA range. Note that some BA heads are frustratingly close to metric sizes, but they tend to be just sufficiently different to make metric spanners unsuitable without risking damage! See spanner table below. The majority of the components on British bikes of the 50s and 60s used BSF, BSCy and BA threads. BSW was used only rarely on bikes and cars because, being coarser, it was more prone to loosening with vibration. Tiger Cubs and other Triumphs and BSAs of this era are no exception to this and you will find that BSF, BA and BSCy are used throughout the machines. Carrying out most tasks on a Cub really does require a good selection of Whitworth and BA spanners. These are still readily available, but can often be more expensive than their A/F and metric equivalents due to decreasing demand. Originally some Tiger Cub parts - e.g. engine casings - used BA and BSF slotted screws. However many owners, including those carrying out accurate restorations, have replaced them with cap screws. (Cap screws are sometimes nicknamed 'socket head screws' or 'Allen screws' after the hexagonal Allen keys used to turn them.) Both BSF and BA cap screws use the standard imperial/inch Allen keys as used for UNC/UNF cap screws. Whitworth spanners can be marked in a variety of different ways. Sometimes they will just have the BSW size stamped on them - for example '5/16 W' or even just '5/16'. Others may show both the BSW and the BSF sizes - '5/16 W, 3/8 BS' or just '5/16, 3/8'. Note that BSF is often abbreviated to just 'BS' - not to be confused with BSW! BA Spanners generally have the BA thread size marked clearly. There are lots of thread tables on the web that give more details of the different threads, their sizes, cutting angles, etc. A thread table reference booklet such as the Roebuck Zeus Data Charts can also be handy. A thread gauge is the most accurate way to measure the pitch of threads. These are available from engineering suppliers and online. Mike Estall, author of the invaluable Tiger Cub Bible, has produced a 'Consolidated Tiger Cub Parts List' which gives useful sizes and references for all fasteners and components used on the Cubs. Using this in conjunction with the Triumph Parts Book and thread tables makes buying fasteners or repairing threads a lot easier. Check out the Rebuilding page for more details of these and other useful sources of information. Wikipedia provides further details on BSW, BSF, BSCy and BA threads.